Visitor maps for your website. IP Location of visitors. Know where your website visitors come from, webmaps are free and easy to place in your webpage. 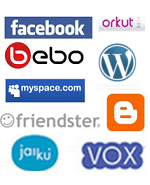 These maps show the ip location of your visitors and friends and are updated in real time, you can display weekly activity, monthly + more..
Add your visitor map to any of your social networks or blog pages such as: myspace, facebook, bebo, imvu, blogster, blogger, blogspot, wordpress plus many more. Start creating your own map!